Hassan Sharif passed away on September 18th, 2016. The acuity with which he perceived the world, as well as his free spirit, have left their mark on a new generation of artists and critics of the region from which he originates, the Middle East, and later on the international scene as well. For our first exhibition without him, we wished to return to his train of thought and specifically to the series Books and Boxes started from 1982. At first, a couple sheets of stapled paper showcase his experimentations of systematic calculations. Elsewhere, in wooden container with strips of cutout paper, the artist meshes order and randomness. Books and Boxes may also be understood as the construction of a story based on systems of symbols. Using simple materials found in ordinary life, such as newspapers or cardboard, he makes sculptures, which are sometimes autobiographical but mostly result of simple, repetitive actions and gestures of transformation. This laborious work is a form of resistance to economic dynamics and social realities, and echoes with the transformations of the surrounding society and lanscape. To the proliferation of goods, he opposes the duration of the gesture. 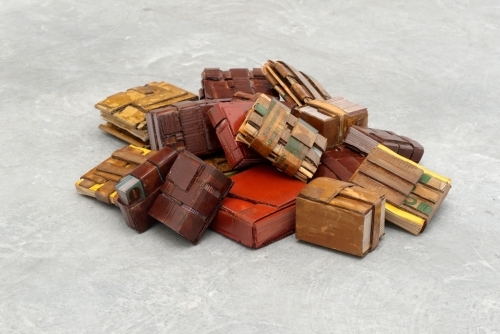 The entirety of the artist’s work resides within the Books and Boxes: the relationship to the other, from desire to frustration, the reality of daily life, and the importance of knowledge. "From the beginning, just by looking at works in my books, I was becoming aware of a different way of thinking and making art. I was always trying to find a way. I knew there was something new and different out there."